With me working in the evenings, dinners have become a bit chaotic. I leave for work usually around 4 p.m. which coincidentally is about the time D gets home, as well. We do a quick car swap and off he goes to pick up kids from school and I head off to work. He's left to himself to manage dinner, homework, chores, and his own grading papers each night. It's very easy to end up sleeping into convenience food mode, which isn't good for our health or our budget. 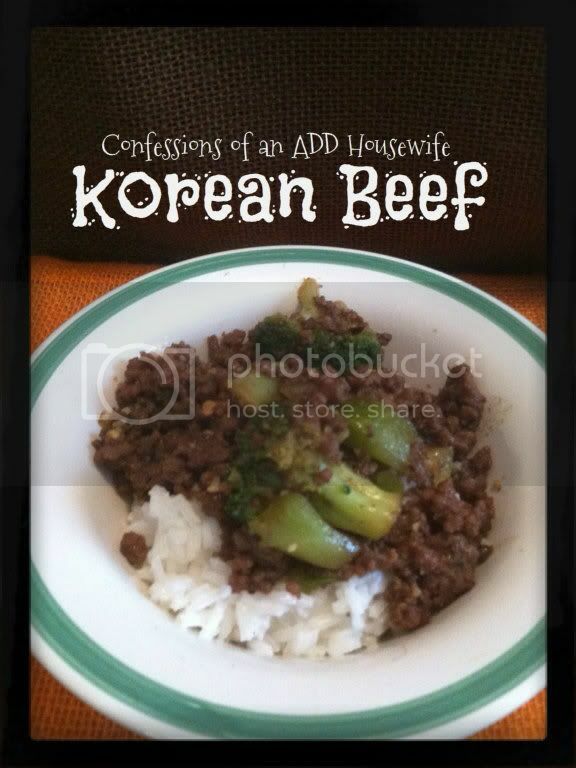 Instead, I do a lot of make ahead meals, crockpot cooking or quick and easy meals like this one for Korean Beef. I stumbled on it on Pinterest. The first time I made it, I took a bite and knew I was in trouble. The good kind of trouble where I have to triple a recipe because everyone in the family is going to want seconds. It's super fast and easy. Tasty. Affordable. Kid friendly. It's like the Holy Grail of last minute meals. Here's the link to the original recipe...and I've included my extra veggified version below.I can't help but add extra vegetables to something like this. And, I cook my rice in the crockpot, so I can just start it when I have time and it's ready for D when he gets back from picking up the kids. Heat a large skillet over medium heat and brown hamburger with garlic. Drain meat. Add brown sugar, soy sauce, ginger, salt and pepper and red peppers. Add in broccoli. Simmer. Serve over steamed rice and top with green onions. This is a riff on what Koreans call "bulgogi!" I am half Korean and make the Korean style with thin sliced beef all the time. We usually marinate it for a few hours and then pan saute it, letting the liquid evaporate so that flavors get really concentrated. If you use the sliced beef, you will need a little toasted sesame oil- it's major flavor! My three year old granddaughter's favorite rice is rice, a little soy sauce, a little sesame oil and some toasted sesame seeds on top. This is a great alternative and I love the addition of the broccoli! Great post!! I never seem to have sesame oil around. But you are right, it does really give a great flavor. My husband lived in Japan for a few years so we have a lot of recipes that are pseudo Japanese. . . trying to get the flavors right with the ingredients we have locally. Followed you over from a link party, and am pinning this to make later in the week. Sounds DELISH. I like the look of this. Thanks for sharing. called bulgogi in korean... yum!